Preparing for your rainwater tank is easy. Two main areas you will want to ensure are correct include your roof and gutters and tank foundations. The roof and gutters of your catchment area are obviously a key component when harvesting rainwater. They should be cleared of any leaves or debris and damaged guttering repaired. If your guttering is not directing the water flow to where your tank will be setup, then you should ideally adjust the level to maximise the rainwater collected. 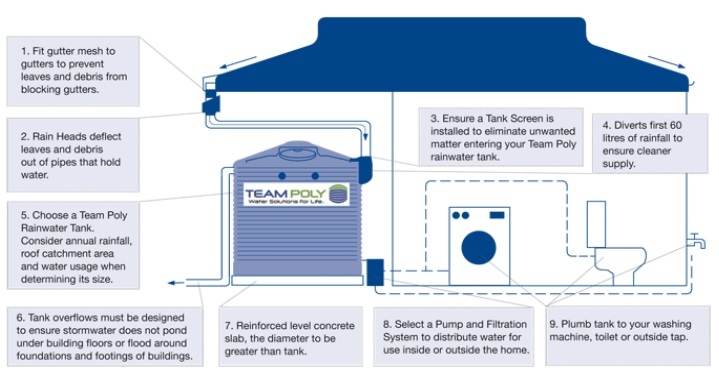 The most important task in preparing for your new poly water tank is to create a flat level compacted base. This can be a concrete slab or a crusher dust base, but not sand. For a concrete slab, it is recommended that that they be at least 25 MPa and 4 inches thick with F62 mesh halfway through. It should be level and flat with no bumps or indents and the finished surface should have a trowelled finish. Crusher dust bases are a bit more complex, but look a little better and are more cost effective. A crusher base must be at least 12 inches wider than the diameter of the water tanks and flat and level. This means removing a minimum of 4 inches of natural earth and refilling with at least 3 inches of crusher dust and dry cement powder. This must then be compacted with appropriate equipment and then screed so that the surface is flat and free of any rocks, tree roots, etc. If you would like to bury your water tank it is important to seek an engineer’s advice before beginning any work. It is generally not recommended to bury your poly tank more than 1 metre into the ground. The hole must be dug 30cm wider than the base diameter of your tank, and then the foundations prepared like normal.